Went on a service call for an Amana gas oven that wouldn’t fire up. When I arrived, I turned on the oven to verify the complaint– the ignitor (the thing pictured here) glowed but didn’t fire up. I measured the current draw on the ignitor (see this page for more details on that) and read 2.8 amps– too low to open the gas valve. When I turned off the range and removed the ignitor, I saw that its wires had been pinched so badly that it appeared the wires were intermittently making contact with the cabinet and arcing. While this wasn’t the direct cause for the oven not firing up in this case, it could have eventually become a cause for other problems, such as nuisance breaker tripping. Anyway, installed a new ignitor and they lived happily ever after. 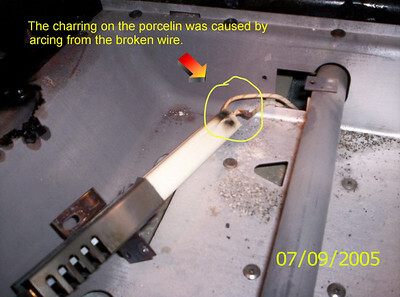 This entry was posted in Oven Repair on October 22, 2005 by Samurai Appliance Repair Man.